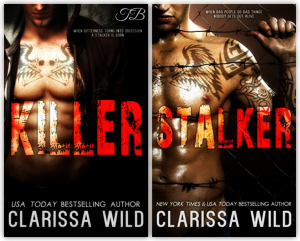 Clarissa Wild brings you STALKER, a Dark Romance, which is a stand alone without cliffhanger. F**k me once, I’ll f**k you twice … then I’ll bury you. I swore that I’d come for her, to claim what belongs to me: Her life. I’m not a good man. On the contrary, I love to be bad. It’s in my veins. Just like it’s in my veins to ruin her. She’s an actress, pretending to be a saint, but we both know that isn’t true. One way or another, she’ll pay for what she did. I will hunt for her. Make her fear me. Make her body mine. No Cliffhanger. Complete at 94000 words. Stand Alone. Well…wow….jumping straight from Killer into Stalker turned out to be one violent, eye-opening and gritty ride. I’m surprised anyone was left standing at the end. Where I felt slightly detached and only in like with the story and characters in Killer it felt like Stalker literally hit me across the head demanding I pay attention whilst Vanessa and Phoenix made me feel slightly sick, disturbed, morose and uncomfortable. I have to admit to having this macabre fascination with everything as I read. You know that feeling where you look around – thank the stars for the anonymity of kindle – as you’re reading thinking bloody hell I hope no one realises and think there’s something wrong with me. Yeah, it’s that kind of book! What was missing for me in Killer came to light in Stalker and I understood. This story was written with intense emotion and we get the background needed to shed a light on the why’s. The why’s interrupting a continual harrowing and intense circumstance that you want to look away from but can’t. I’m so incredibly wary of spoiling anything so I won’t even go there. You guys all know those books that you shouldn’t enjoy, you’re ashamed to enjoy, and you’re embarrassed of your feelings for the ‘bad’ guy…the ‘bad’ woman. Well, this is one of those stories, if you read this review and think yes, I know what you mean then pick up this story! Now, it can be read as a standalone yet Killer is the prequel. The only thing I can’t decide on is whether I would have preferred to read Stalker before Killer. In some respects I think I would have enjoyed Killer more. But that’s probably just me, an individual preference. Kudos Clarissa Wild; this was one hell of a dark and fucked up ride!